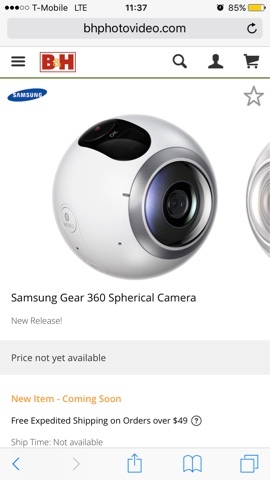 Samsung Gear 360 Change to Price and Availability? Is there a change to the Samsung Gear 360’s price and availability? B&H Photo previously posted a price of $399.99 then later $349.99, and an expected availability of May 2016. But now their page has been revised to delete both price and availability. Meanwhile, they didn’t change their page for the LG 360 Cam which is still available for pre-order for $199.99 (based on T-Mobile’s promo, the LG’s availability appears to be around May 2016). Samsung Gear 360 Release Date is April 29!